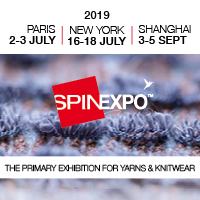 The 11th session of SPINEXPO New York, a leading international industry sourcing exhibition dedicated to innovation in yarns, fibres and knitwear, will take place from 16-18 July 2019. Hosting leading high-quality international exhibitors, the show welcomes a globally diverse range of international visitors including; Couture, ready to wear, knitwear, hosiery, Activewear and homeware. The show attracts senior decision makers, sourcing professionals, designers and buyers, who come to source new, innovative and directional products, make new connections, strengthen long-term relationships and be inspired. Each season SPINEXPO collaborates on over 1,000 specially designed swatches and panels from knit and weave to embellished textile pieces. “We want to immerse our visitors and exhibitors in a wealth of innovation that we hope in turn inspires them as individuals and within their businesses,” said organisers.